HGH Fragment 176-191 peptide is a modified form of amino acids 176-191 of the human Growth Hormone (GH) Polypeptide. Fragment 176-191 has been shown in tests to induce lipolysis or fat breakdown, and even inhibit lipogenesis, the transformation of food materials into fat. In laboratory tests on fat cells from rats, mice, pigs and dogs, the hgH fragment released the fat specifically from obese fat cells but not from the lean ones, reduced new fat build up in all fat cells and enhanced the burning of fat. In rodents (rats and mice), hgH fragment reduced the body fat in obese animals but, increased fat burning without altering food consumption or inducing growth (as it does not increase IGF levels) or any other unwanted Growth Hormone effect. There is no question as to why bodybuilders of the modern era utilize human growth hormone. Its ability to regulate fat loss, pack on size and increase IGF-1 levels is just a few of the many attributes that many seek. HGH Frag 171-191 was developed so that bodybuilders and athletes not looking for the growth properties from HGH could still reap all the results of its amazing fat loss properties. The chemical sequence of HGH Fragment is such that it contains very hydrophobic amino acids. Hydrophobic amino acids are very difficult to dissolve. Hydrophobic molecules are literally “water- fearing”. A good example of a hydrophobic compound is oil- petroleum. You could see this when BP’s oil well spilled millions of gallons of oil into the Gulf. It was not “diluted” by the water. Water is actually an excellent solvent for most peptides. HGH Fragment is by far the most hydrophobic of any peptides available related to GH research. Now, you have probably purchased HGH Fragment in the past and not had this issue. That is because your HGH Fragment came from a bad lab, whether it be USA or China or Kingdom come or because- for reasons I cannot fully explain- this is not an issue with every reconstituted vial. The process in some labs includes using a copious amount of acetonitrile. To put this into perspective- when our peptides are being synthesized and then tested for purity- a small amount of acetonitrile is used to remove the impurities from a column that is being tested during the HPLC- .1% acetonitrile to be exact. Now acetonitrile is a poisonous substance and needs to be removed from the final product- (it metabolizes into cyanide). If this substance is not removed, the effects can be very dangerous indeed. Some chemists use 10% acetonitrile to dissolve the HGH Fragment! So, although this is very counter-intuitive, the fact that your HGH Fragment is cloudy tells you that it is true HGH Fragment, and that it does NOT contain copious amounts of acetonitrile. We know it is not aesthetically pleasing, and again it is hard to wrap our minds around the fact that if something is cloudy that it might not be “bad for us” as compared to something that is not. It is counter to our experiences in life. Here is the “fix”. 1ml of .6% Acetic Acid will completely resolve the situation! The peptides are completely solvent in that mixture. Mix 2 ml water with the GH Fragment Vial. 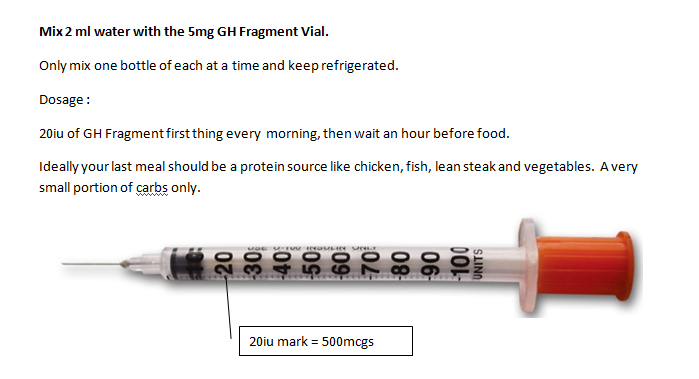 50iu of GH Fragment first thing every morning, then wait an hour before food. Ideally your last meal should be a protein source like chicken, fish, lean steak and vegetables. A very small portion of carbs only. Mix 2 ml water with the 5mg GH Fragment Vial. 20iu of GH Fragment first thing every morning, then wait an hour before food.